I’ve seen these structures described as barns, and perhaps they’ve been used for that purpose for many years, but their design indicates an earlier commercial use. 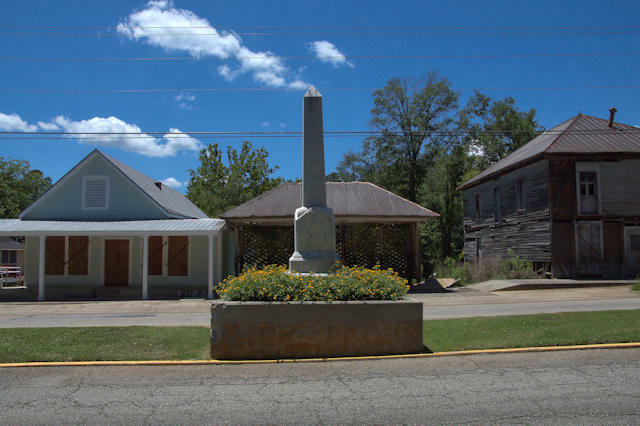 The obelisk is the Reverend Daniel Marshall memorial, placed in 1903 to commemorate the founder of Kiokee Baptist Church. 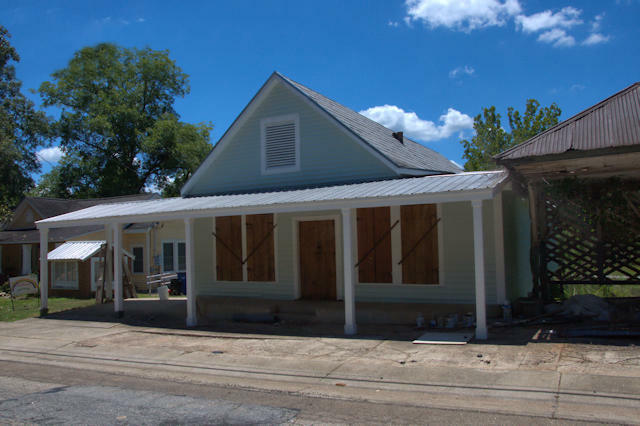 The larger structure was likely a general store/mercantile. As far as I could tell, this was the only private business in Appling. This early Federal Works Project was designed by Augusta architect A. Brian Merry. R. A. Bowen was the contractor. 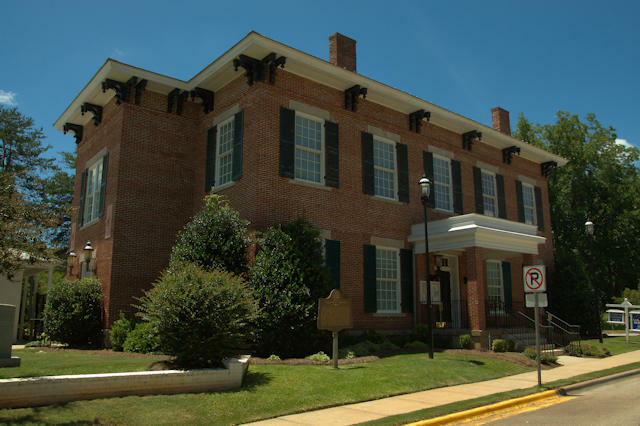 It is now home to the Columbia County Historical Society. Columbia County was created in 1790. The area was settled by Daniel Marshall and the Baptists in 1772. 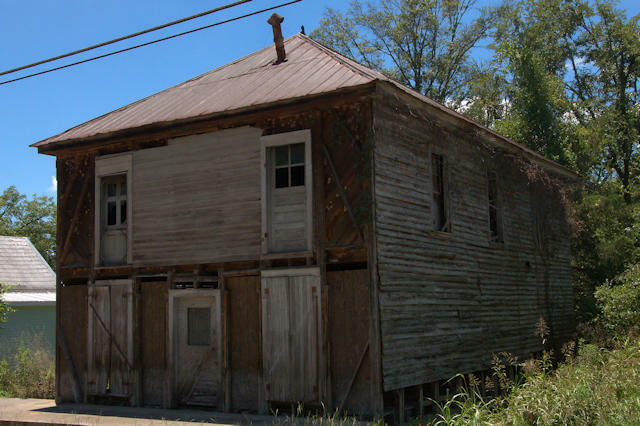 The dead town of Cobbham served briefly as the first county seat, followed by Kiokee, near the Savannah River. 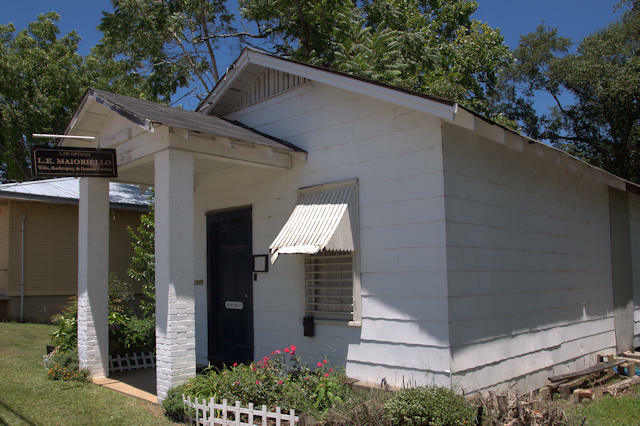 Because Kiokee was considered too far from much of the population to be a practical site, William Appling offered land for a new county seat and it was named in his honor. 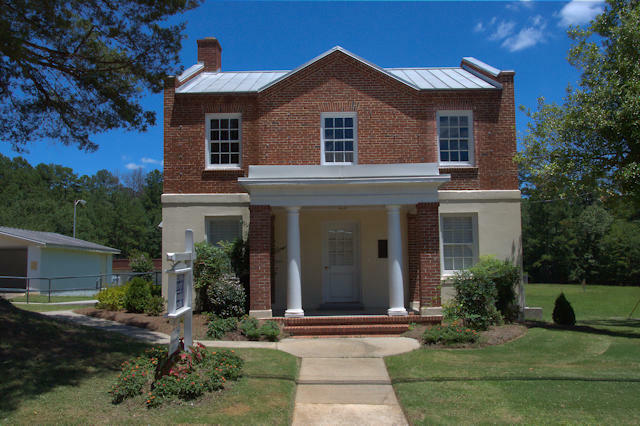 The first courthouse in Appling was built around 1793, followed by a more suitable structure in 1812. It served until the construction of the present courthouse in 1856. Columbia County is perhaps unique in Georgia in that it has essentially two county seats. By the 1970s, this courthouse was in a bad state of deterioration. Since the county was in the midst of a population boom and the majority of the population was clustered near Evans, the Appling courthouse was no longer adequate for housing all the offices of local government. Around 1980 a new Columbia County Government Center was constructed in Evans, with additional facilities following in the 1990s. Most functions of local government are now carried out there, while a few offices are maintained in this historic antebellum courthouse. Some court proceedings are still held here, making it the oldest courthouse in the state still in use. When Daniel Marshall established the oldest continuing* Baptist congregation in Georgia in 1772, it was a violation of the established laws of St. Paul’s Parish, contrary to the tenets of the Church of England, and he was soon arrested. Upon his release he continued the mission of the church and built the first meeting house at the site of present-day Appling. 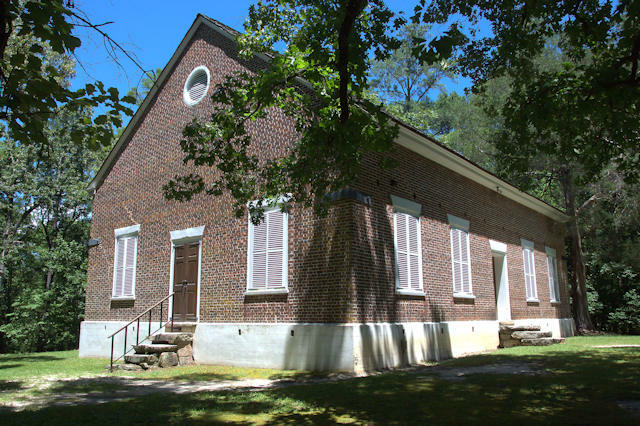 A new church known as Marshall’s Meeting House was built in 1789 near the banks of Kiokee Creek. 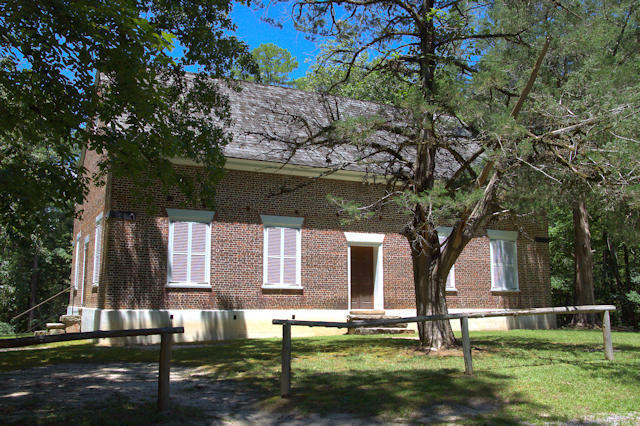 By 1806 Marshall’s Meeting House was in bad disrepair and the congregation raised nearly $4000 for the construction of the present church, known as Kiokee Baptist Church, which was completed in 1808. A Mr. Danielly was the brick mason and brothers John and Hezekiah Bond did the carpentry. The congregation only used this church until 1827, when they again built a new church in Appling proper, likely to accommodate a growing membership. It served until it was destroyed by a tornado in 1875 with the congregation meeting in the courthouse until another church was built. A modern facility in Appling serves the church today, while the historic church is used for special events. Daniel Marshall was a native of Connecticut and established Baptist churches in Pennsylvania, Virginia, North Carolina and South Carolina and served as a missionary to the Native Americans. The Marshall family preached the gospel at Kiokee for sixty years. After Daniel’s service (1772-84), his son Abraham (1784-1819) succeeded him, followed by his grandson Jabez (1819-1832). *-The first Baptist church established in Georgia was the Tuckaseeking Baptist Church in Effingham County. They were a Seventh Day Baptist congregation and were active from 1759 until about 1763, when persecution forced them out of Georgia. Never a common sect in Georgia, the Seventh Day Baptists claim just one congregation and one mission in the state today.